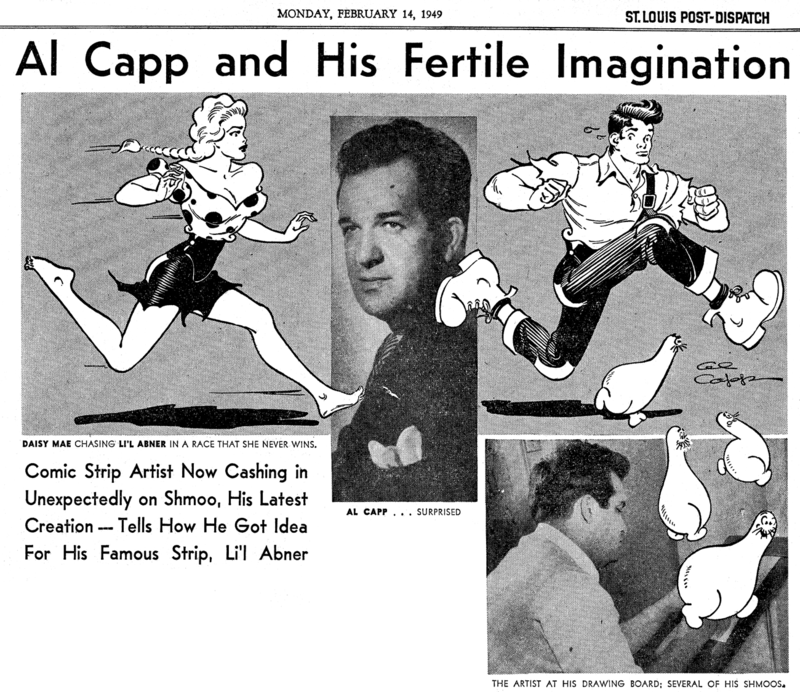 When cartoonist Al Capp allowed his famous hillbilly character, Li'l Abner, to wander away one day last year from Dogpatch and into the adjoining Valley of the Shmoon, not even the fertile Capp imagination could foresee the results. It was, of course, in the Valley of the Shmoon that Li'l Abner discovered that "pee-koolyar-lookin' little animule" the shmoo. Shmoos, as readers of the Post-Dispatch comic pages know, multiply faster than rabbits. They die happy and ready to cook when you look hungrily at them. They lay eggs and give the finest creamery butter and grade "A" milk already sealed in a bottle. Occasionally they even lay a cheesecake on a plate. Broiled they taste like steak; fried, they're the "yummiest" chicken. Their eyes make the best suspender buttons and their whiskers excellent toothpicks. Their hide makes the finest leather or cloth depending on how thick you slice it and in times of a housing shortage can be used for shingles, wallpaper, roofing or floor covering. And while that lovable little animule, the shmoo, was busy under Capp's direction performing all these feats in the funny papers, it was also turning a neat trick on its own. That trick was the earning of some $250,000 extra for Capp through the licensing of the shmoo likeness for kid's toys, pants buttons, balloons, soap, lapel pins, shmoo banks and other assorted novelties that are today being sold to the people of a nation that went shmoo crazy. Sensing the trend, the book publishing company of Simon and Schuster brought out a collection of cartoons entitled "The Life and Times of the Shmoo." Newspapers throughout the country reviewed the story of the shmoo right along with such important books as Eisenhower's "Crusade in Europe." The CIO News, official organ of the Congress of Industrial Organizations, jubilantly proclaimed the story of the shmoo as "a great social message." Life magazine saw the shmoo in a different light. Said Life: "Henry Ford discovered the advantages of shmoo-ism long before Al Capp. The shmoo is our economic principle." But whatever the arguments, the shmoo not only delivered the inhabitants of Dogpatch, at least temporarily, from the dietetic monotony of "presarved turnips," but put a whale of a lot of unexpected dough into the already well-lined jeans of Cartoonist Capp. Now pushing 40, Capp can remember the day he arrived in New York with six bucks in his pocket and nothing to recommend him as a cartoonist, but a 21-year-old's ambition. He had his early days of hunger in a Greenwich Village garret, living on hope and 10 cents worth of buckwheat cakes a day. He did odd jobs in a syndicate art department. He invented one comic strip described by a newspaper editor as "by far the worst in the country." And he was about to give up his dreams of an artistic career when one day, with an armload of rejected cartoons in the crook of his elbow, he was stopped by a stranger. "I'd like," said the stranger, "to make a bet with you. I'll bet that what you've got under your arm is rejected cartoons." "I ain't fixed to pay bets," snapped the dejected Capp. "But if it makes you feel any better, that's what's in this package." The stranger was Ham Fisher, already a successful strip artist and Capp took Fisher's offer of 10 bucks to finish a comic page. Then he became Fisher's assistant. But before long he had an idea for another comic strip — Li'l Abner. Capp was sitting in his garret one night when from somewhere across a courtyard, came the sound of a phonograph record—"I love mountain music, good old mountain music, played by a real hillbilly band." Suddenly Capp had an idea. One summer with a friend he had bummed his way around Southern Kentucky. He had done some painting along the way and he remembered that one day while he was sketching a landscape a hillbilly boy had come up and peered over his shoulder. "Whatcha doin?" asked the kid. "Embalming the landscape for posterity," answered Capp. "That," said the kid after a long pause denoting serious thought, "don't make sense." Capp remembered that he had sketched the kid and rummaging in an old trunk he found the sketch. He also remembered other mountaineers he had seen on his trip. It wasn't long before his imagination had created and populated the community of Dogpatch. The strip began in a New York paper in August 1935. Today Li'l Abner has made comic strip history, with some 500 papers and 40,000,000 readers. Familiar to readers of the daily and Sunday comic pages of the Post-Dispatch are Mammy and Pappy Yokum, the greatest turnip farmers in the world. Readers also know and love Daisy Mae Scraggs, the heroine of the world's greatest and longest-drawn-out romance. They know too, such characters as Marryin' Sam, and Lena the Hyena, the Ugliest Woman in the World. And millions of college kids throughout the country celebrate Sadie Hawkins day, which Al Capp began more than 10 years ago. In fact, until the advent of the shmoo, Sadie Hawkins day brought as much fame to Al Capp as the comic stiip Li'l Abner itself. But it was left to that figment of the Capp imagination, the shmoo, to cap the climax of the cartoonist's career. It wasn't long before this all-purpose little animule had swept the country. Shmoos were dropped to hungry Berliners by United States airlift flyers. The shmoo was the subject of many newspaper and magazine editorials. Otherwise heavy book reviewers called the "Life and Times of the Shmoo" positively shmoo-pendous. The invention of the shmoo was seen as the tip-off to a Capp-italist revolution. It was also seen as the most shmoo-nificent piece of red propaganda ever foisted upon an unsuspecting public. The shmoo was said to be shmoocially conscious. The shmoo was said to have been inspired in its doings by Eric Johnston, the master shmooze artist, who has been going around the world insisting that European capitalism is defective for the simple reason that it has never shmooed itself up. In fact, a brand-new "ism" was born into the language. Schmooshialism came to be mentioned along with capitalism, communism, fascism, etc. Capp had let the public peek through his shmoo into the Garden of Eden. The capitalist and the commies saw it in a different light, but everybody agreed that what the shmoo meant was "un-rationed shmoo for everybody." In addition to the some quarter of a million dollars Capp will get, for his comic strip Li'l Abner this year, he will also garner in an almost like amount for allowing the Shmoo to be used on various products. All of which makes Capp pretty happy but nonetheless still baffled over the success of the shmoo. "It was," he says, "the greatest shmooprise a guy could have." Thanks to Cole Johnson, who supplied a scan of this clipping from the St. Louis Post-Dispatch. This is part 5 of a 5 part series that they ran in 1949.